In 2011, we interviewed Jonathan Spyer about the publication of his book The Transforming Fire: the Rise of the Israel-Islamist Conflict. Our first question focused on his contrast between the real Israel and what he termed the “mythical Israel”, a place of “uninterrupted darkness and horror, in which every human interaction is ugly, crude, racist, brutal.” In our work at UK Media Watch, we explained, we’ve observed and documented this crude caricature – divorced from any trace of balance or context – which informs much of the reporting about Israel at the Guardian and elsewhere in the British media. In Spyer’s response, he suggested that the “sheer volume of copy and programming hostile to Israel” creates a media echo chamber which drowns out any alternative view of Israeli life, or of the conflict more broadly. So, we sometimes try to highlight the rare occasion when British news outlets break free of this myopic style of reporting, providing readers with a dash of nuance – a glimpse of life in the democratic Jewish state not coloured by the “mythical Israel” narrative. This brings us to a truly outside-the-box Guardian report by Kate Shuttleworth illustrating the extraordinary daily Jewish-arab coexistence in Israeli hospitals – a fact known to Israelis, but obscured to most outside the country by the steady drumbeat of stories highlighting allegations of Israeli intolerance and racism towards its minority population. 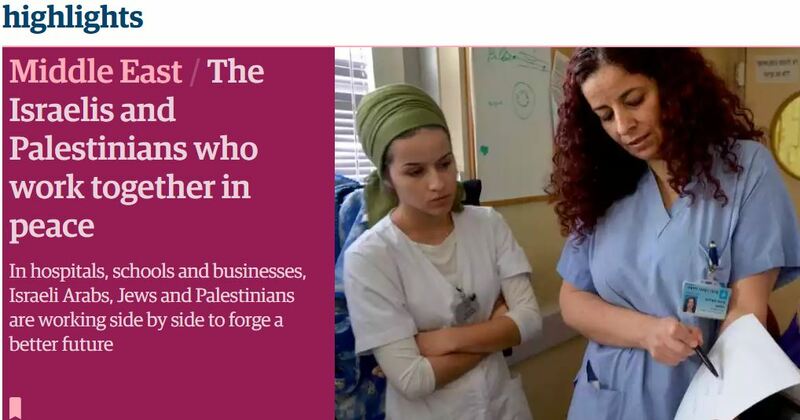 The Guardian (The Israelis and Palestinians who work together in peace, July 11) features Rashad Rizeq, 32, a Palestinian from Ramallah who works as a cardiac resident at Hadassah Ein Karem hospital in Jerusalem, a facility representing “a rare island of calm where Jews, Israeli Arabs and some Palestinian staff work together to treat patients”. Rizeq tells Shuttleworth that though “there are growing divisions on the streets of Jerusalem, he does not face animosity within the hospital grounds”. The article also focuses on the director of the hospital’s heart institute, Professor Chaim Lotan, who selected Rizeq for his placement and who’s quoted stating his belief that “ties between Palestinian and Israeli hospitals will continue to strengthen”. “For me it doesn’t matter who someone is, once they are here they’re people. I don’t care about ethnicity or age,” he added. The Guardian report also features other Israeli models of coexistence, including the the Max Rayne Hand in Hand school in Jerusalem (which has a mix of Jewish, Muslim and Christian students), an NGO that takes Jews on tours of Arab towns and a group which assists Jewish-Arab start-up ventures. Though Shuttleworth greatly exaggerates Arab-Israeli tensions ‘outside the hospital grounds’, we nonetheless commend the Guardian for at least briefly providing readers with a glimpse of the diversity, pluralism and tolerance in daily life – ‘the real Israel’ that Israeli citizens and residents know so well. Well, well – there’s a first time for everything. Perhaps I am being a bit cynical (as if!!) in thinking that the Guardian is anticipating the imminent downfall of leader of the Labour Party taking his ‘friends’ with him. No doubt disappointment on that score is a more realistic outcome. All sounds good, but is there an undercurrent in the reporting of ‘there but for the existence of the Jewish state’. Also, did the Guardian article discuss – or even mention – the PA’s attitude to this good news? The staff at that Racist Rag the Guardian must have gone into apoplectic seizure at the decision to write a feel good article about Israel…. Der Guardian needed an article to point to, to counter documented charges that it’s institutionally anti-Semitic – SORRY, Anti-Zionist.